Why we founded Savage & King. Will: I started my career at Haymarket Publications in September 1987, working at Marketing Magazine selling ad-space over the phone at their then offices in Lancaster gate. Those were incredible days in advertising, Saatchi & Saatchi were in rampant ascendancy (they tried to buy Midland Bank not long after I’d started work) and BBH had gained instant fame with the Levi’s Jeans campaign featuring Nick Kamen. New ‘creative shops’ were launching all the time – HHCL, Simons Palmer Denton Clemmow & Johnson & Gold Greenlees Trott. Tiger: “Incisive, funny, sometimes shocking, creativity were at the heart of these agencies, if you’re old enough, you’ll remember the campaign for Benetton”. Will: It was at this time, my wife Tiger Savage started her career in advertising, having joined SPDC&J out of the School of Communication Arts, being mentored by the late Paul Arden, amongst other industry luminaries. Over the next 15 or so years, before agencies started being subsumed into global agency networks – think WPP, Publicicis, Omnicon, London was a hotbed of creativity, where client CEO’s and marketing directors appointed agencies for their breakthrough campaigns, rather than global infrastructure. Of course, the world turns – the internet happened, more TV channels were launched, people shifted from reading ‘Caxton content’ (paper) to consuming digital ‘shots’ of content, you only have to look at the success of Buzzfeed over the past year, up from 100m monthly users on platform, to the Billions. In today’s world where everyone has a smartphone and an attention span of a gnat, genius creativity is now the rarity, not the norm. Tiger and I long talked about this, and with me stepping down as King of Shaves CEO this weekend last year, it seems an apt time to write why we’ve quietly founded our own ‘shop’ as they’re still called and what our ambitions, intentions are. Tiger: First and foremost, and as Del Boy says so pithily, ‘He who Dares, Wins’. Well, this has always been the case. So, we aim to do some daring stuff. But, to do daring work, you need clients with the same attitude. Working with them is not going to be so easy, as not many exist these days. After all, when you have a great job, and you believe your agency is doing great work, and the budgets are being spent, and the sales are OK, well – why change? One of Will’s favourite phrases is ‘Embrace change as a constant’. In short, if you’re not changing, evolving, doing things different, better, with purpose – others will be – and you may well become left behind. In a matter of months, not years. Witness for example how Seven Hills, who would once be considered a ‘PR company’ have evolved into a ‘Campaigning Company’ working with clients who ‘Care, Share, Dare’. Or, Unruly Media – who work outside of the conventional social media platforms, to engage with viewers in a highly targeted fashion, using compelling content to drive commercial or social engagement metrics’. Tiger: As we launch, we are approaching the ‘Season of Epic Christmas Adverts’ – kicked off by Adam&EveDDB a few years back with their ‘John Lewis Christmas Story’. But, how long before these become History? What then? And, in a world where trust, authenticity and reputation is critical – certainly in a world of Rate or Slate as powered by Tripadvisor, Tinder – how to brands, large and small truly engage with their audience, and ensure they thrive, not just survive. Will: It was no accident our first client was the digital challenger ‘unbank’ – Ffrees. Any company, brand working with money has it’s work cut out – witness the lost reputations of our legacy banks. If not a bank – well – who are you? Thus, we convinced the CEO of Ffrees, Alex Letts – to let us pivot Ffrees to be an ‘UnBank’ for the people, to lead a social sharing ‘UnBanking Revolution’ headed by that most maverick of social media ‘hellraisers’ – Jon Morter, he who got Rage Against the Machine to the Christmas #1 in 2009. Tiger: My work speaks for itself – from Adidas to Nike, from BA to Virgin, from Unilever to Lancaster, from Becks to Kronenbourg, from Levi’s to Wrangler. 11 years spent at M&C Saatchi exposed me to the best – and worst- of the agency world. I worked with great people, on amazing campaigns. But, my incisive creativity – how I ‘earned my stripes’ would oft be dulled by the huge agenda’ing, politicking and downright selfishness of who she had to work for. So, stepping down in 2010 was a way for me to step back from an abyss, where everything I wanted to do, was being sullied in the pursuit of Mammon at scale. Will: Although I studied Mechanical Engineering, am now a Doctor of the University at Portsmouth, and famously (I guess) founded King of Shaves following redundancy in 1992, one of my key skillsets has always been ‘getting something going’ – or, in a more pointed way, ‘selling someone something’. King of Shaves was THE stand-out success story of the men’s grooming sector, defining it’s global growth and challenging for consumer choice and change in a sector dominated by a handful of multi-national behemoths. When we launched, there was Gillette, Colgate Palmolive, Wilkinson-Sword. And then us. Oh, how we changed things. By doing diffferent, better, in a way that always put the customer first, and the ‘fat cats’ last. Going back to Ffrees, delivering that to them as simply taking my learnings as CEO of King of Shaves, Tiger’s creative & strategic skillset, and as she always says “Button. PRESS”. If you’ve taken the time to read this, and are thinking ‘Yep, he makes some good points” and “Yep, we could do with a bit of what he and his wife have” then why not drop us a note. I for SURE don’t intend to publish an amazing website with references to all the work Tiger and I have done. It’s easily found out there on the internet, for reference. But, it’s also in the past. What interests us is the future. Tiger & Will: It’s your future. Your brand. Your company. Your challenges. And, now we might deliver YOU a bit of ‘Impossible is Noting, Just Do It’ work. We know who we’d like to work with and for. We’ve been in touch with some people already. But, nothing starts without a first step being taken. If I don’t get in touch with you, why not get in touch with me. Dare you. will@savageandking.com finds us. 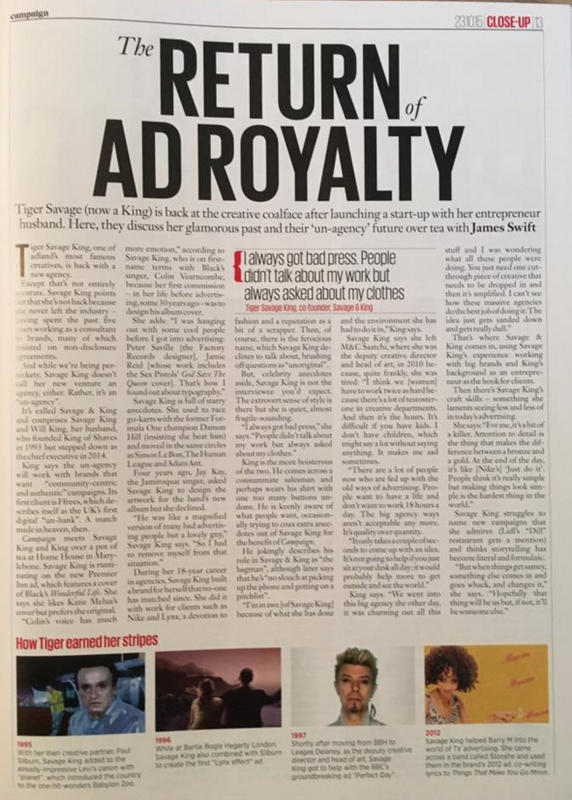 Savage & King Launch Article, Campaign. “Why we’re loving Jon Morter”, Campaign. Interview with Tiger Savage here.